A Defining Moment (or two) and RJD Link-UP! I am so thankful that Dawn and Susie dreamed up and acted upon the idea of Random Journal Day! I have been occupied with running the marathon of Lent and Life this past week. Filling my days with running (because I am training for a longer race this year),spending time with family and friends and sharing my passion for personal discovery through art+journaling. To pause here today feels good. To celebrate and catch my breath before heading out to the culmination of much prayer and preparation for a day retreat. 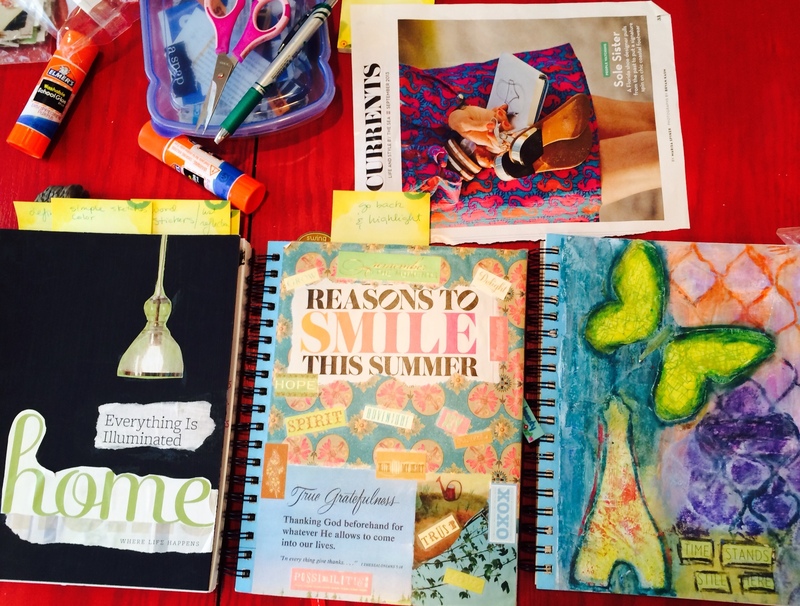 To share the day with twenty or so other women exploring our emotions with Tracy Flori, life coach extraordinaire, and yours truly lauding the benefits of journaling and collaging as a means to process life. I pulled out TWO random journals to share ideas with the retreat ladies, and then I remembered it was Random Journal Day! The first journal was from February-March 2012, and I just happened to turn to a page about Lent and Adventure. What is appealing about adventure? What is daunting? What feelings does the word evoke? Why is adventure such an [enticing] invitation? Can the the mundane, routine life be considered an adventure? Why or why not? I think it would be interesting for me to actually answer these questions in my current journal! Will you join me? 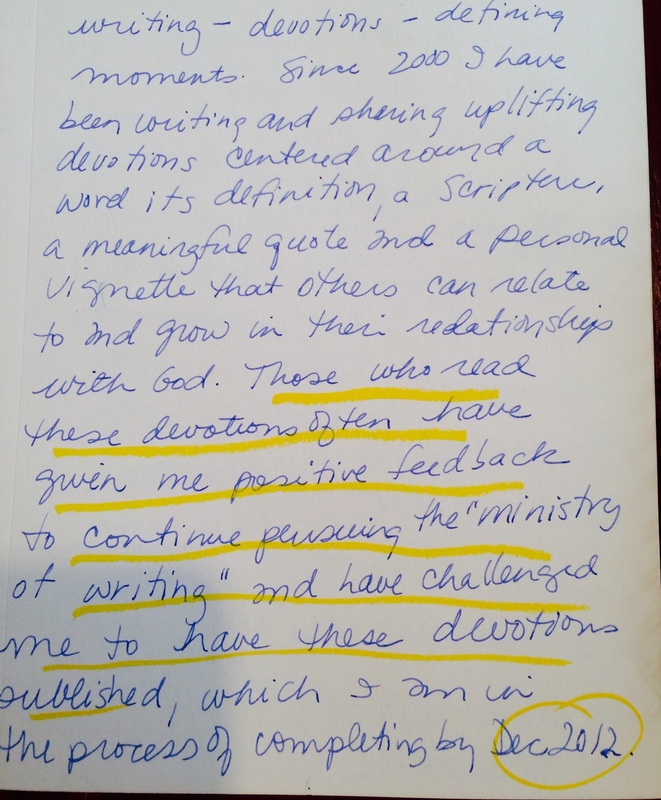 I found the page where I committed to publishing my devotions. Tracy Flori coached me through my goal setting and it was a lovely dream come true. However, that little book has been collecting dust. And I think God may be nudging me to promote it again. So here goes. The adventure continues and God delights in our discoveries! What is God nudging you to do today? Yes, I agree with Carol and love that line! But I so also think you should absolutely promote that sweet book! I love it, It is powerful and filled with word loving, grace infused revelations worth sharing! I wish I was attending the retreat with you and Traci! I love collage, but am a little bit intimidated by the paint…I dabble. But, cut and paste are my happy place and of course the written word. Thanks for your enthusiasm, my friend! Thanks Dawn for the shout out about the book! I actually sold a few this past weekend! God is good! YES! The random moment that becomes a defining moment!! Isn’t that how it usually is? And it cold pass without notice unless we are journalers, writers and artists! Yes I agree Susie, we are the seekers, the observers and the scribes of the defining moments! Kel, I still have your little volume on my shelf and actually have not finished it. I stop to ‘savor’ the pages, like the small bites of a truffle of deliciousness….not often enough! Your book is brilliant and pray it finds a wider audience. You’ve prompted me to start my own ‘Defining Moments’ journal–every once in a while a word will pop in my head and I write it down at the top of the page with the date and leave it blank……..Some day I intend to give those words more attention, but for the mean time, I’ve got them written down. Newest entry? ‘Deliver’–Jesus delivers me from sin and UPS can deliver a package. What’s all that meaning about? Well, that’s what I intend to find out. You are a gift–may God bless it (your book) and you! Thanks Jody! I love that you created a Defining Moments journal…I look forward to seeing some of the words make it to your blog posts! or poems or maybe even a book someday!